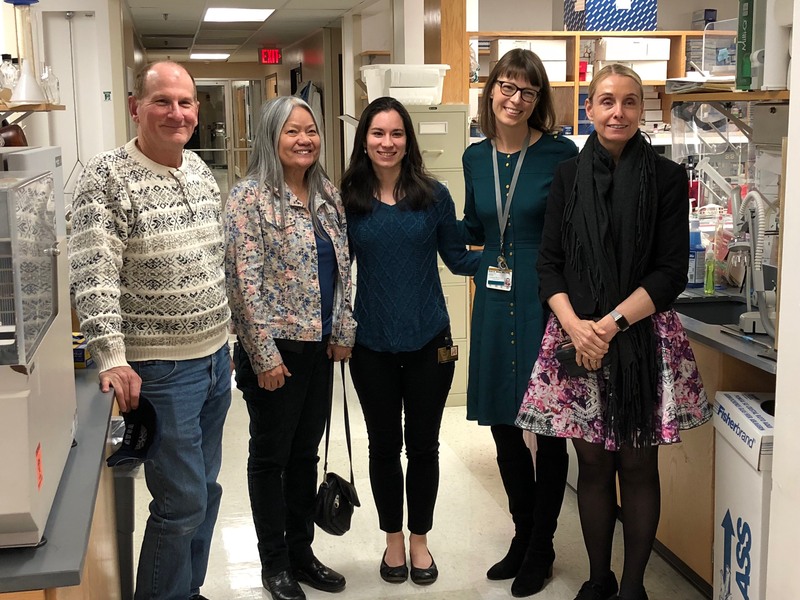 We were honored to once again visit the research lab of Dr. Elizabeth Phillips at Vanderbilt University Medical Center in Nashville. The research is tedious, complex and encouraging! There are currently 24 sites across the US and Canada focused on the research of drug induced disease. Dr. Phillips’ Laboratory works closely with Murdoch University in Perth, Western Australia as well. The research team is currently writing a grant to fund universal registries and sample collection. There is encouraging advances in the study of t-cells and blister fluid however more samples are needed to advance this important research. There are between 1 and 5 cases per million people in the US, however there is no mandatory reporting of SJS at this time. Only 2-8% of those with the genetic biomarker for SJS will manifest symptoms however it can be devastating for those that do. Early diagnosis, discontinuing the drug that triggered the attack and specialized treatment of symptoms is essential. Awareness is Key and financial funding is helpful so please help us spread the word! You may donate directly to Vanderbilt University Medical Center using the link from this website. The mission of the SJS/TEN research program at VUMC is to 1) improve preventive efforts and facilitate translation of genetic screening into the clinical and pre-clinical setting to prevent SJS/TEN through excluding patients at risk from high risk drugs and facilitating the development of safer drugs less likely to cause SJS/TEN. 2) Identify biomarkers associated with SJS/TEN that could lead to earlier diagnosis and specific and sensitive measures for point of care diagnosis in communities without access to specialty care (to expedite transition into specialty care such as Burns centers 3) Identify the mechanisms driving SJS/TEN that will lead to an understanding of the molecular and cellular signals that will lead to discovery of targeted therapies to prevent morbidity and mortality associated with SJS/TEN. Angela was unique. She was a trendsetter. Everybody says she was “cool”, but not only that, she made people around her feel cool. She had a way of making everyone feel welcome around her. People that didn’t “fit in” felt like they fit in when they were around her. Friends told me, “She was the life of the party! The party really didn’t get started till she got there and when she left, the party was over”. She was a leader not a follower, a trend setter in fashion and social media. She was one in a million. Her humor was different, which is why she was so funny. Her friends said, “She could make you laugh till you cried”. She could not even die traditionally. The disease that took her was one in a million. Even in death, she stood out from the crowd. We wanted her to stay here with us. It’s hard to believe that anyone could love her more than we did but God does and He wants her in Heaven now. In John, Chapter 14, Jesus says, “I go to prepare a place for you. And If I go and prepare a place for you, I will come again and receive you unto myself. That where I am you may be also.” Well, that was over 2,000 years ago and he’s still not done preparing heaven. I was comforted this morning as I read this passage that the reason God needed Angela at this time was because He needed her innovative creativity to make Heaven more unique and more fun. But why now, why couldn’t He wait? …Maybe He wanted her now before she “grew up” if you will, before she grew older and more conservative as people do when they get older. He wanted her at the height of her unique, loving and fun spirit. Or, maybe He just needed someone to keep Him laughing. At any rate, Heaven just got a little bit better. So I say to you remember her spirit and let your memories of her inspire you to step out and share that same unique spirit of hers with the world and make it a brighter place just as she did. On December 23, Angela had plans to go out with her friends but cancelled because she had a fever and didn’t feel good. She took ibuprofen for the fever and went to bed. On Christmas Eve Angela texted her mother, Wanpen at 2:38 pm showing a picture of her eye infection and complaining of pain. 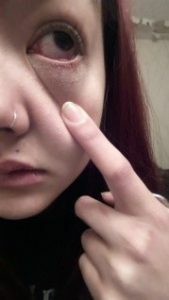 She thought she had “pink eye”. Wanpen told her to go to Carle Convenient Care. She went and saw a doctor at 4pm. The doctor gave her some erythromycin ointment for her eye and tested her for strep. The strep test came back negative. The doctor told her she had a viral infection, to take something for her fever and to get some rest. She went back to her apartment, took some ibuprofen and went to bed. I called her later asking her if she wanted to go to 7:00 Christmas Eve Mass with us. She said she didn’t feel up to it. At about 9:00 pm she called me and asked if she could spend the night with us because she felt so bad. I picked her up at her apartment and brought her home. Her eyes were swollen and her throat hurt. I took her temperature, (103.7) gave her some Tylenol and she went to bed. At about 2am Angela woke me up saying, “Dad, you have to see this!” I went into the bathroom where she was and she showed me the inside of her mouth. The inside of her cheeks and throat were black and blistered. I gave her some warm salt water to gargle, she went back to bed and I got on the internet to try and find out what I was seeing in her mouth and throat. Nothing online resembled anything that I had just seen. She woke up a few hours later and gargled some more salt water. Her throat hurt and she was in pain. She went back to bed. It wasn’t long after we arrived at the ER that she was in a room and a doctor was examining her. Soon there were 5 doctors examining her and conferring with each other trying to figure out what was happening to her and what the next step should be. It was like an episode of the TV series “House”. One doctor told me that she had the symptoms of Stevens Johnson Syndrome. He also told me that they may have to send her to the burn unit at Memorial Medical Center in Springfield or Barnes Jewish Hospital in St. Louis. However, someone decided that she should stay at Carle’s ICU. Angela arrived at ICU sometime before noon. By this time, the outer skin on her lips had dried up and peeled off, her eyes were badly swollen (almost shut), her face was swollen, her chest hurt and her throat hurt so bad that swallowing was intolerable. It wasn’t long before they were giving her morphine for pain. The morphine took the pain away from her chest and eyes but not from her throat. They were afraid to give her too much morphine because it might affect her breathing. Meanwhile back at home, Wanpen was preparing Christmas dinner for 17 guests including her mother. Wanpen picked up her 95 year old mother at her nursing home that morning. We thought that this was probably going to be her last Christmas with her family (she died almost a year later on Dec 14, 2016). Had we known the seriousness of Angela’s condition at this time, we would have cancelled Christmas dinner and Wanpen would have spent the day at the hospital with Angela and me. She was still in a lot of pain but her cousins, Joe, Adva and Joy came by to visit and it seemed to cheer her up. Then her brother Tim and his girlfriend Jojo came by and she was joking around with them. Angela’s mother, Wanpen, her two sisters, Jitra and Suthisa and their friends stopped by to visit after that. Wanpen told Angela that she would pray for her and asked her to pray for her own healing. She said that she would. Wanpen told Angela that she loved her and Angela said, “I love you, too”. That’s the last words she spoke to her mother. She still seemed in good spirits at that time even though she was in a lot of pain. After they left she was hurting more than ever. She was screaming whenever she had to swallow. The doctor eventually gave her some more pain medication for her throat and after a while it seemed to help a little bit. By this time, skin was peeling off of the backs of her ears and the palms of her hands. But still, she was texting her friends and half joking about what was happening to her body and asking them to come visit her. I spent the night with her and was awoken by the doctor at about 5am (Dec 26). The doctor told me that what I saw happening to her outer skin was happening on the inside of her body. “She’s burning from the inside out”, he said. He said that they would have to sedate her, put her on a ventilator and drain the fluid out of her lungs because they were full and she wouldn’t be able to breathe without a respirator. This is when I first realized that we could lose her. I completely broke down crying. When I got my composure I went to see her before they went through with this procedure. Skin was peeling off of her face now. I told her I loved her and she said, “I know, I love you too”. That was the last words she ever spoke. (Up to this time she continued to text her friends, post status updates on Facebook, tweet her friends on Twitter and send selfie pics of herself right up to the point that they had to put the breathing tube in her). Her condition seemed to level off after that. When the doctor that had put her on the respirator that morning came back that night for his next shift he said he was a little encouraged because she hadn’t gotten any worse. But they still did not know what was causing this. They were not sure if it was viral or bacterial. They thought it might be Mono, Mumps or Measles so they put her in an Airborne Isolation room. They put her on a wide spectrum of antibiotics hoping that one of them would work. The fact that she wasn’t getting any worse made us feel a little better. Then the doctor told us that her kidneys were failing. She would be put on a Continuous Dialysis machine to filter the blood for the kidneys. Her other organs were weakening also but her heart was still strong. It was at some point in this day (Dec 26) that they thought it would be a good idea to send her to Barnes Jewish Hospital in St. Louis. But there was a problem. There were severe storms and tornado warnings out and helicopters could not fly. Also, they thought a 3 hour trip by ambulance was too long and too risky, that she might not survive the trip. By Sunday, Dec 27, they had ruled out that it was an airborne disease and took her out of isolation. They narrowed down the antibiotics to treat it as a bacterial infection and gave her Intravenous Immunoglobulin (IVIG) to try to help her own immune system fight it. Sometime that day her kidneys failed and she was getting more and more fragile. In the late afternoon two doctors came to us suggesting that she have lung bypass surgery. They had tried to drain her lungs again but the fluid had gravitated so far down into her lungs that it was impossible to drain enough fluid to help. They said that her blood was not getting enough oxygen to sustain her organs. The lung bypass machine, ECMO (Extracorporeal Membrane Oxygenation) is basically an artificial lung that oxygenizes the blood. A tube is inserted in the femoral artery (in the groin area) and another tube is placed in the jugular vein (in the neck). The unoxygenated blood flows from the femoral artery into the ECMO (artificial lung) where the blood is oxygenated and then returns to the body though through the jugular vein and on to the heart with 100% oxygenated blood. They told us first of all that the surgery was extremely risky and that in her fragile state she may not survive the trip from her room on the 7th floor to the operating room on the first floor. Also, that if she survived the surgery that she may not survive the trip back up the elevator to ICU. So our choice was to do nothing with little chance of survival or attempt the risky surgery to give her and the doctors more time to fight the infection. The surgery was a success. Wanpen, Tim and I and the many visitors as well as the tremendous following on Facebook were encouraged by this, thinking that if she could survive this, she could survive anything. However the next day, Dec 28, things got worse. The doctors were more or less back to square one in fighting this mysterious disease. Now they weren’t sure once again if it was bacterial or viral. At 4am they checked her eyes to see if her pupils responded to light and they did (This is something they did every 4 hours). It was this morning that they called in a retired Infectious Disease specialist to see if she could come up with something new. At 8am they checked Angela’s pupils again to see if they reacted to light. They did not. Then they contacted Barnes Hospital again. The doctors at Barnes said they had a bed for her. The weather was still not good but they were going to send one of their own “fixed wing” aircraft to pick her up. It was extremely risky to transport her but by this time it was the last option. The doctors at Carle told us that the people at Barnes wanted them to do a CT scan on Angela’s brain. If blood was in her brain, there was no hope. If there was not blood in her brain, they would fly her to St Louis. The CAT scan pictures showed that she had multiple pockets of blood throughout her brain and she was brain dead. We were left with the decision of leaving her on life support or turning it off. Wanpen and I went in and held her hand, hugged her and said our goodbyes. We told all of Angela’s friends and our friends that were in the waiting room that they all could do the same. When everyone had said their goodbyes, we asked the doctors to turn off life support and we waited until her heart stopped at 6:01 pm Dec 28. After multiple diagnoses throughout these 4 days, the doctors now believe that Angela succumbed to Stevens – Johnson syndrome / Toxic Epidermal Necrolysis (TEN), also known as Lyell’s syndrome, a rare, life-threatening skin condition that is usually caused by a reaction to drugs. They now think that it might have been triggered by Ibuprofen. I might add that Angela has been taking Ibuprofen since she was a baby. SJS/TEN can be by triggered hundreds of different drugs.